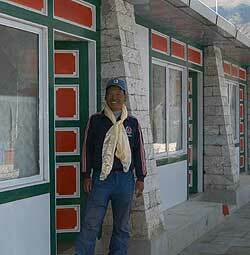 Well, we have made it to Lukla. Last night we slept at that beautiful little lodge in Phakding, along the banks of the Dudh Kosi. The walk from Namche yesterday was enjoyable, but we began to remember those big umbrellas we had purchased on our first day trekking as we got closer to Phakding. The sky was dark and threatening. We saw not a drop of rain as we walked. Within a few minutes of arriving the skies opened up and delivered a downpour. Several of us took the opportunity for afternoon naps listening to the rain on the tin roofs of our rooms. Today's walk into Lukla was relaxing and scenic. I think everyone in the group was tuned into all the wonderful sights along the way. No doubt a bit nostalgia already as our final trek day came to a close all too soon. 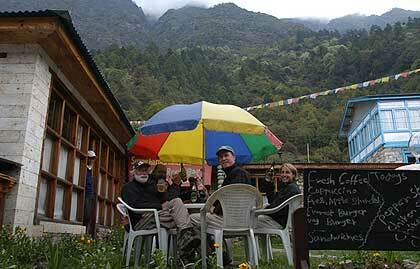 We had a lunch in Lukla prepared by Bal and the rest of the kitchen staff and then the crew was out to find some nice spot to enjoy the afternoon. Dan identified the best outdoor pub in town and we sat and listened to rock ballads on their fuzzy sounding speakers while Dan entertained the staff by juggling bottles of Everest Beer! We are still having great fun with all our staff. Min, with his wry smile, but always watchful for each of us, is a favourite. As is the case on all BAI trips, it is Min who checks carefully behind to make sure we have not left something. We usually do, and I cannot count the times he has approached each member of this trip with something of value that we left. Today when we got to Lukla and Min surprisingly left his much valued Ray Ban sunglasses on the counter of a tea shop, Dan was quick to put them on. We all enjoyed waiting for Min to realize that his Ray Ban was missing (and that Dan was wearing them).